Today’s lot are all the evidence you need to see that the C86 movement was like punk in that it inspired another generation of musicians, many of who came to be seen as representative of the movement even though they had little to do with its origins. 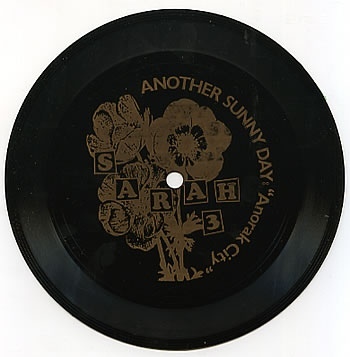 Another Sunny Day didn’t release any music until April 1988. It’s a cracking name for a band especially when it covers the fact there was just one member, a talented multi-instrumentalist and vocalist called Harvey Williams. It’s a tremendous bit of music albeit, at a juncture of nearly 30 years, it feels atypical of its time and place. I’ve no doubt that those who were right at the heart of C86 and all that subsequently followed regard Anorak City as one of the most important and influential bits of music ever released. But then again, these are the folk who believe, wrongly, that C86 was the birth of indie pop. Harvey Williams would later join The Field Mice, Blueboy and Trembling Blue Stars all of which were hugely popular bands on Sarah Records. I suppose that makes him the C86 equivalent of Malcolm Ross who was a member of three bands on Postcard Records…..
Smiths-esque is a bit of an understatement…..and listening to what is a truly outstanding record make me wonder why Moz didn’t pick up the phone to Harvey and ask to work with him after Johnny had upped stick and left his band…..